Mr. Taranto's column today also links briefly to an article from the Beeb's online World News Edition that's entitled "Niger may sue over uranium slur." Typically (given its rabid anti-American agenda), the BBC leaves the strong impression that the Bush administration was not merely duped by forged documents regarding Saddam's alleged efforts to buy Nigerian yellowcake uranium, but that the Bush administration actually was guilty of forging the documents itself! "'The US forged a letter on Niger's behalf .... this is a shame.'" Thus the Beeb breathlessly reports, and leaves unchallenged, this statement of fact. Indeed, although it's not quite clear exactly what later statement by the US the Chairman alleges to have been untruthful and injurious to the reputation of Niger, this constrasting "truth" — i.e., that the US government itself was the forger — appears to be the central premise of the anticipated lawsuit, which is expected to result in "heavy damages." If the Beeb takes this threatened lawsuit seriously, shouldn't we? Someone warn John Ashcroft, quick! In the four months since the uranium documents were unmasked, the press has made only halting progress in identifying the counterfeiters, which may help explain why the documents seemed credible in the first place. This, mind you, was based on the work of such media as The New Yorker, the Washington Post, the New York Times, the Los Angeles Times, and CNN — not exactly a list of Dubya's closest friends and allies. [t]he FBI is investigating the whole affair, NEWSWEEK has learned, trying to determine if the documents were just a con job by a[n African] diplomat looking for some extra cash or a more serious attempt by Iraqi nationals to plant a story. So it looks like the Beeb has scooped all these other news agencies! Why, I'll bet it was Karl Rove who forged those documents using some scissors and that creaky old photocopier just outside Dubya's office! I can't wait to hear in more detail how the opposition party chairman in Niger and the local FM radio station there outdid both Michael Isikoff and the FBI on this story! The government of Niger is being pressurised to sue the US for damages over allegations that Iraq tried to buy uranium from the West African country. Later, near the end of the story, the Beeb also reports that the "US was pressurising the West African country to keep quiet on the issue." 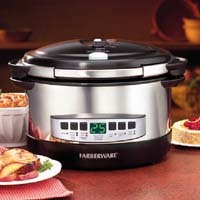 The Farberware Programmable 8-Qt Pressure Cooker! Never mind John Ashcroft, someone find out whether Martha Stewart is still out on bail! It's good to know we can always trust the BBC for eloquence and accuracy, isn't it? And who sez the English know nothing about good cooking? The French have nothing over the Beeb when it comes to cooking the facts.